Staying over at friends or family for the weekend can be fun, but it can also feel a little impersonal. 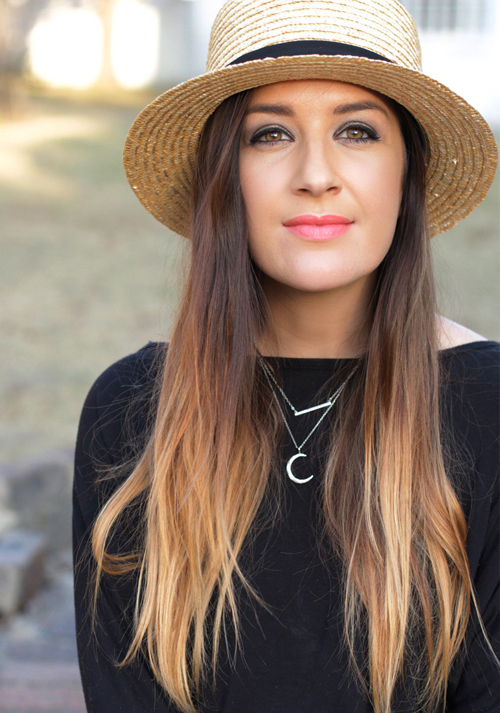 Of course you’ll miss your own home, your own space and having your things at arm’s reach, but often the nuisance of having to bring all your beauty items “just in case” can become annoying. So what do you do? 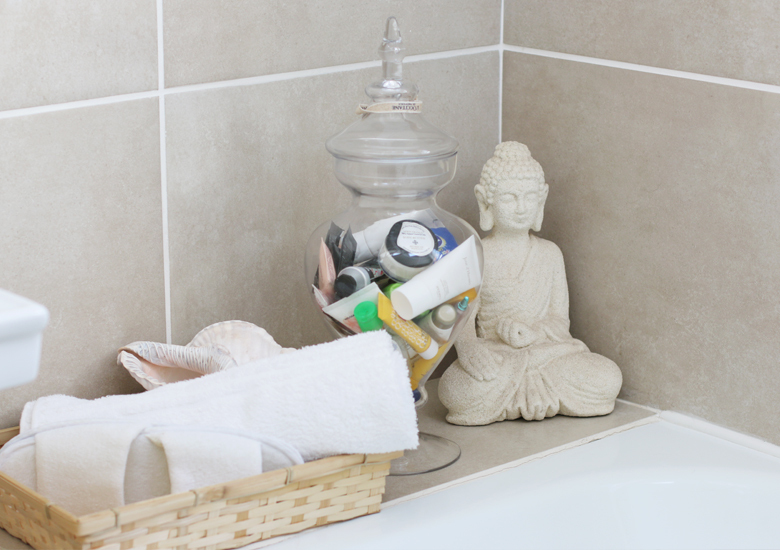 Make sure your guests enjoy their stay with you by turning your guest bathroom into their own little beauty sanctuary. Obviously, you don’t have to go all-out and make your guest bathroom resemble a spa or a hotel (unless you have the means and the ways), but there are a few finishing touches you can incorporate to make it a little more indulgent. Since I left behind my beautiful kitchen in Durban (let’s not even get into how much I miss it), I decided to use my Apothecary vases for a new purpose. Previously, I used them to store my starches (like pasta and rice), which I displayed on my gourmet kitchen counter tops. With the move, one sadly broke and I had far less counter space in my new kitchen to display them anyway. Instead, I used my surviving jar to make my guest bathroom a little more indulgent. So far, the feedback from our guests has been great! What I do is fill the jar with little bits and bobs; samples and testers of beauty, skin and hair products that would otherwise annoy me. I’m sure the fact that I’m a beauty blogger plays a big role in my accumulation of these little miniatures, but you can actually buy travel sized samples from places like Clicks and Dischem and fill up your Apothecary jar. Think mini hand creams, cute little cream pots, sachets, tubes of miniatures that you may get “as a gift with purchase” offers. 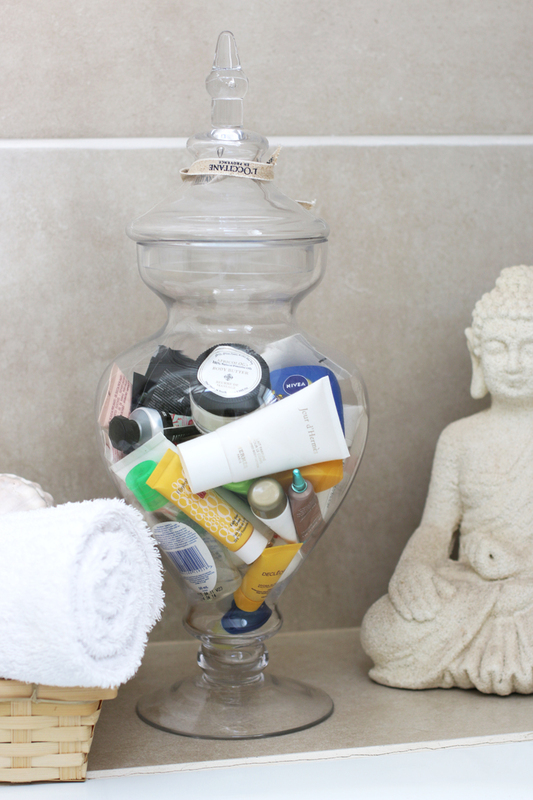 You could even use the Apothecary vase to create a styled selection of soaps. 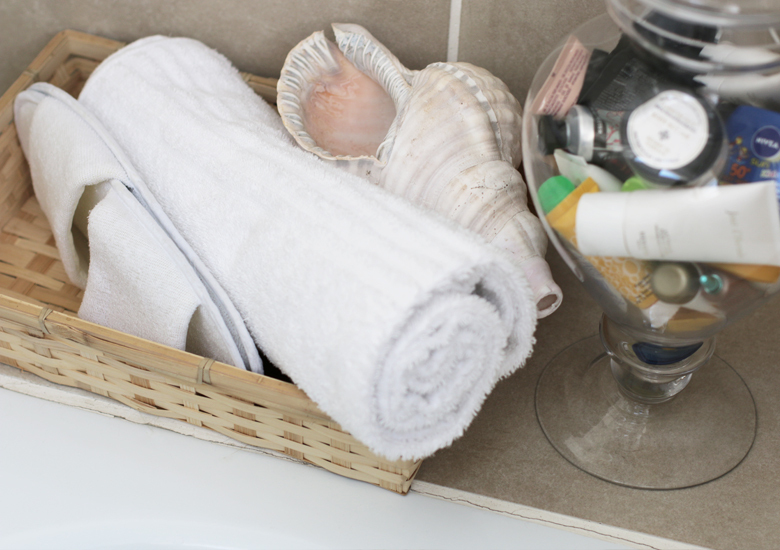 They just make beautiful, functional and thoughtful finishing touch displays for your guest bathroom. Don’t you think? I always ensure that I have dressing gowns in my guest cupboards – because I think it’s just nice and usually when you’re staying over you don’t always think to bring “lounging around on a Sunday morning” gear along with you. Plus, it’s also nice to slip on a gown when you’ve just had a shower instead of having to be fully dressed before you greet your hosts. I had the space in my guest bathroom, so I added another little finishing touch in the form of this “spa basket”. I’ve just got a handtowel rolled up very spa-esque and a pair of disposable spa slippers in there, but you can add things like bath salts, candles and face cloths to make it look more indulgent. Obvs you’ll need to replace the slippers after your guest has used them, but you can buy similar ones in boxes of 100 from places like this and this or you could go with single ones like these which are slightly stronger and can be washed for a couple of wears. If you have any more ideas be sure to leave them in the comments below.